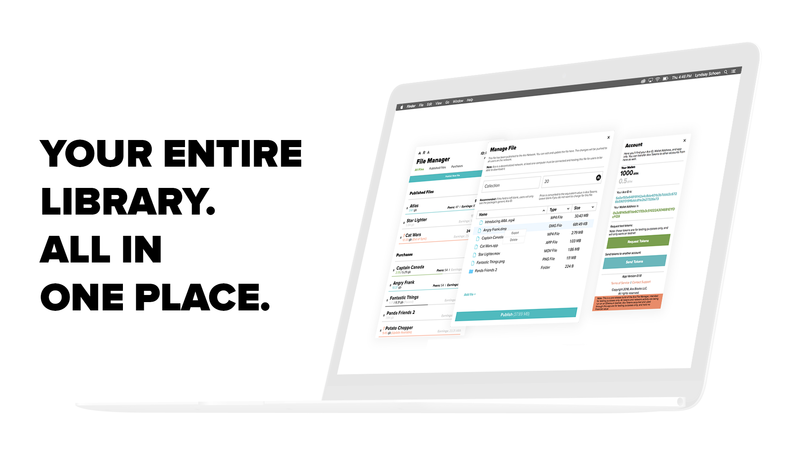 Publish Instantly. Manage Directly. Introducing Ara File Manager. Today, we are really excited launch our first application on Testnet. 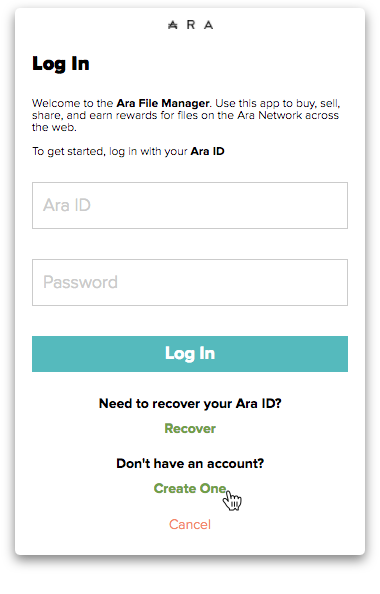 The Ara File Manager is a decentralized app that gives users a clean and simple interface for interacting with the Ara network. The app allows users to publish content into the network, purchase content, download & share files, earn rewards and manage their wallet. 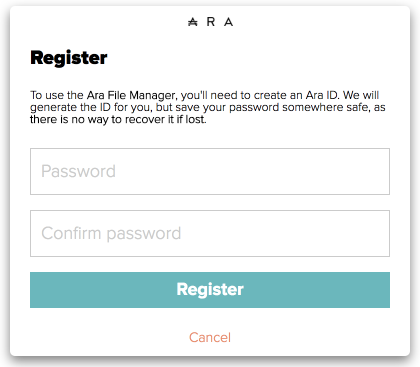 With the Ara File Manager, creators are given the power to control how their content is received by their community. No more having to wait for large companies to approve content, and no more relying on centralized servers. 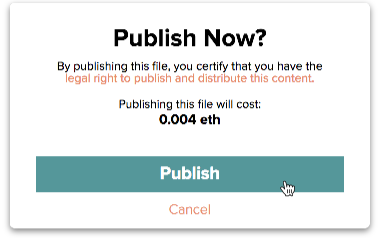 Creators can maintain total control over updates and changes to their content, publish new versions of files and instantly distribute them to every user who shares them on the network, and adjust pricing and naming at any time. You control your content from release and beyond. 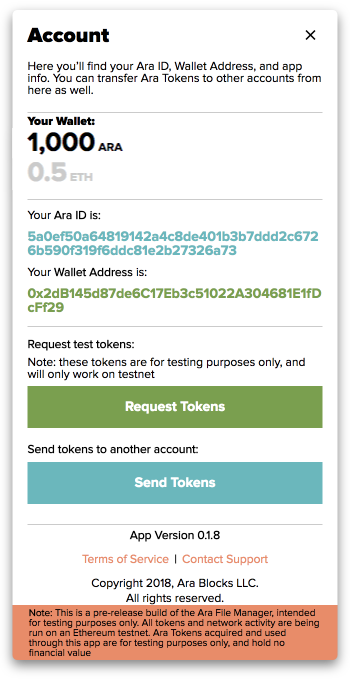 The Testnet application is an open “beta” using test tokens of no financial value. 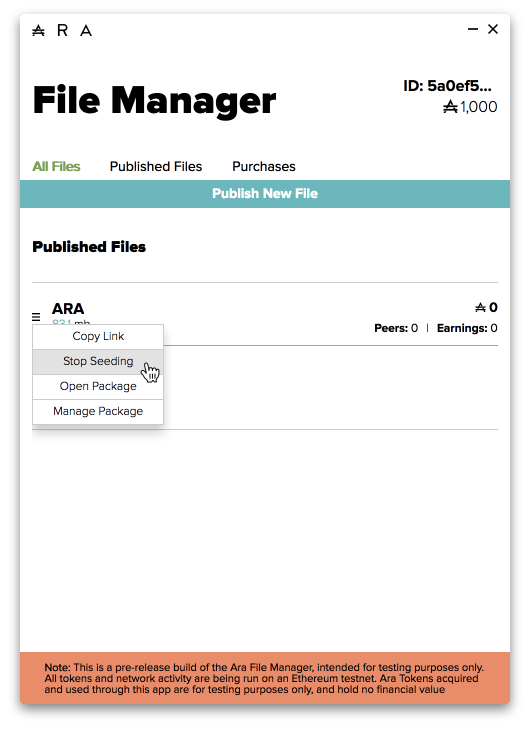 If you are interested in joining our beta group, reach out to us to get the Ara File Manager App. Once you have the application, we have a straightforward step-by-step guide to help you begin your decentralized content journey. 3. Congrats! You officially have an AraID. Save it in a safe place. 4. THIS IS VERY IMPORTANT: DO NOT LOSE THIS. 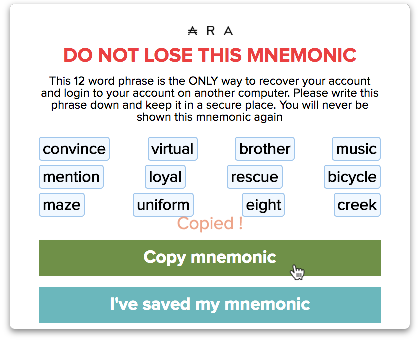 Save your Mnemonic in a safe place. It can never be recovered. A Mnemonic is a crucial aspect to a secure, decentralized identity. The extra effort in saving your 12 word phrase in a safe place (such as a file folder or safe) will help protect your data and identity from getting sold or hacked. You are ready to download content! Try out this link. 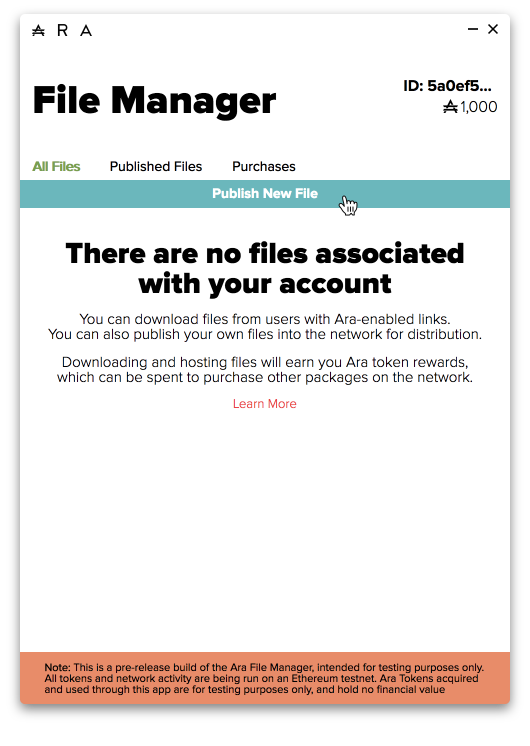 (If clicking the link doesn’t work, try pasting this: https://ara.one/testlink.html in a new browser window to get a modal that asks you if you want to open it with the Ara File Manager app). 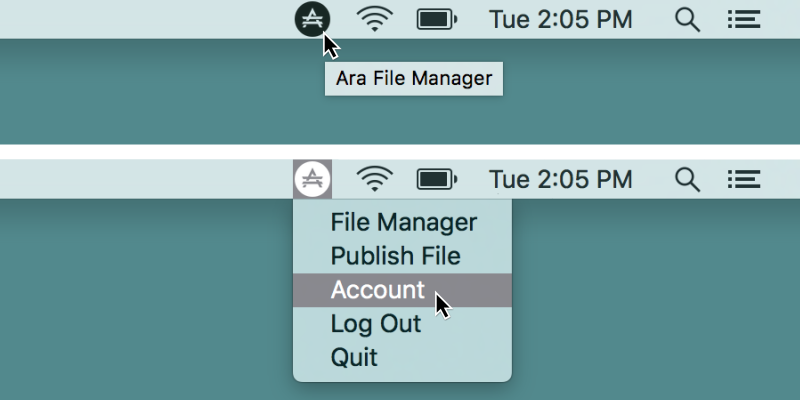 A modal will pop up in Ara File Manager. Confirm the purchase. 2. Congratulations! 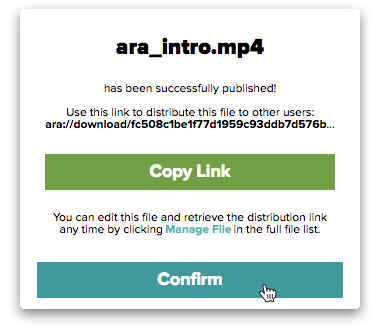 You have downloaded your first piece of content on Ara File Manager. If you run into issues, click here. 2. Another mnemonic modal will appear. Again, keep it in a safe place. Confirm initial publishing costs. 3. Choose file to publish and enter details. 4. Another mnemonic modal for the content will appear. Again, keep it in a safe place! 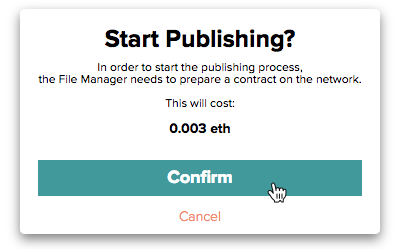 Next, confirm publish costs. 5. 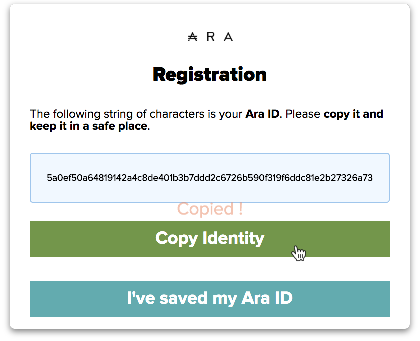 Copy the link and share it with another Ara File Manager user! 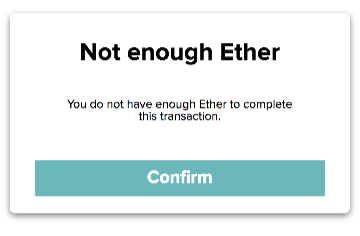 If the “Not enough Ether” modal pops up, follow the steps to get yourself some Testnet Ether. 1. Click the Ara Icon at the top right of the screen. Click Account from the dropdown menu. 2. 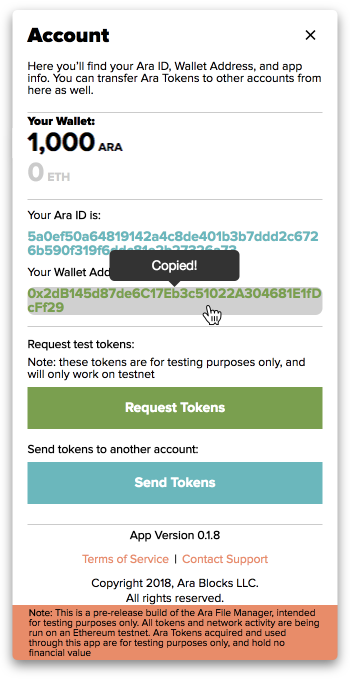 We’ve already set you up with test Ara tokens. You can click the Request Tokens button when you want more. 3. Get Ether on Testnet at your favorite Testnet faucet or use Chrome or Firefox or Brave and go to this faucet, or this faucet, or the Metamask one. 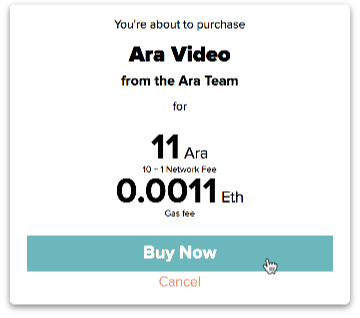 You have Ara and Ether! Now try the link. Email us at support@ara.one with thoughts and feedback. Littlstar is the largest global platform dedicated to immersive virtual and augmented reality content.